Following a trial of 10 remote PA units along Collins Street in Melbourne, a further 11 units were installed in November 2014 as part of the Free Tram Zone project. Since then PTV has funded a further 19 public address (PA) units resulting in a total of 40 across the Melbourne CBD. Customer Information Officers are able to broadcast live and pre-recorded information from the Operations Centre at EROC to the stops. Typical broadcasts include live tram disruption messages and safety reminders. 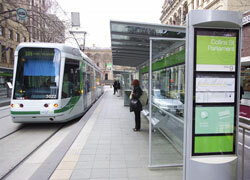 Tram schedules can also be broadcast and repeated at regular intervals and over specific periods of time. Broadcasts also include service change alerts, educational messages and extra trams for special events. Following a customer feedback survey all trial stops were refitted with ambient noise sensing microphones to produce maximum effectiveness at peak times. The DSP on board the TKIS units provides the brains for the speakers and allows the optimal volume to be used in every situation, even when it is a quiet morning and the garbage truck comes past as an announcement is broadcast. Each platform in the system is fitted with a PA Control Unit consisting of STENTOFON TKIS-2 VoIP module, Netcomm NTC-6908 3G Router and associated power supplies.? Connection back to the AlphaCom hosted in the cloud is via STENTOFON Australia?s own Nationwide 3G WAN system,? powered by Telstra NextG.? Control Room operators utilise IP Dual Display Master Stations with Gooseneck microphones, giving them access to 90 Single Touch keys for specific routes and groups, as well as the ability to dial individual stops by their TramTracker ID numbers. For more information visit www.stentofon.com.au.